In Brief: A shorter version of our tough hike up to the craggy peak of Heituo Mountain that finishes by hiking out below the tall cliffs on the Nine-Eyes Tower side of the mountain. On the 1,500m peak of Heituo Mountain. Hike up to the craggy peak of Heituo Mountain, and then down and out below the tall cliffs on the Nine-Eyes Tower side of the mountain. This is a fairly rough hike and part of the track is rather wild, so we’re limiting the number of participants to only fifteen tough trekkers. Because of the steep ascents and descents on this hike we wouldn’t be able to do it in or after rain. Parts of the trail in the first half of the hike could be rather overgrown. 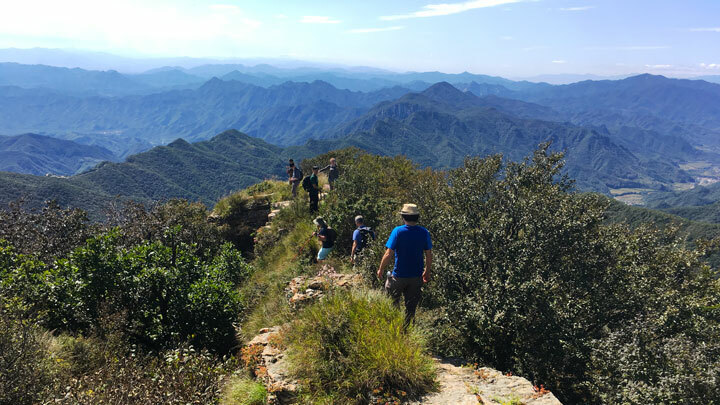 You’ll need to be in good shape and have a good head for heights to enjoy this hike, and we’ll ask you about that as part of the sign up process. We start off near our local guide’s house at Jiankou and then walk up to the end of a concrete road. We step off the concrete road and on to old trails that lead up to previously farmed areas. These areas aren’t farmed so much any more, and we’ll be going through some rather overgrown parts where the trail will be leafy and scratchy. 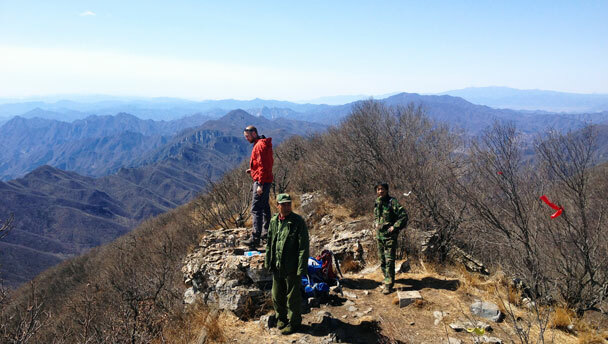 As we get higher the trail will clear a little bit, and we’ll be able to look back for views of the Jiankou Great Wall. We eventually reach a little clearing on a ridge, where we’ll take a break before a steep climb up to the top of Heituo Mountain. The 1,500m peak of Heituo Mountain is a narrow line of rock, and there’s a chance we’ll have to dance past other hikers here. We’ll continue a little further and find a nice open lunch spot. if it’s a clear day we’ll have views all the way back to Beijing. On the south side of the peak is a crossroad in the trail. On this hike we’re going to take the turn that leads towards Nine-Eyes Tower instead of continuing down into the wild Valley of the Pigs. The path down towards Nine-Eyes Tower is very steep to begin with, and could feel tough on the knees. The trail twists and turns through forest and leads below the face of tall cliffs, and just past the cliffs we find the old line of Great Wall that leads down to Nine-Eyes Tower and Jiankou’s ‘Big West’ Great Wall. After a break at Nine-Eyes Tower we’ll take our regular trail down to the bottom, walking a short stretch of repaired wall before following hill trails down and back to the bus. Exposure to heights on rocky crags. Sections of trail that are very bushy. Steep climbs on poorly-formed trails. Level 4+ will be difficult for people who are not used to hiking or are out of shape. Some level 4+ hikes are shorter, but very steep. We had perfect weather for this hike up to the top of Heituo Mountain—click through for 14 photos. See a set of 20 photos from the Heituo Mountain Loop hike—forests, mountains, and super views. 34 photos from the long walk up, over, and around Heituo Mountain. 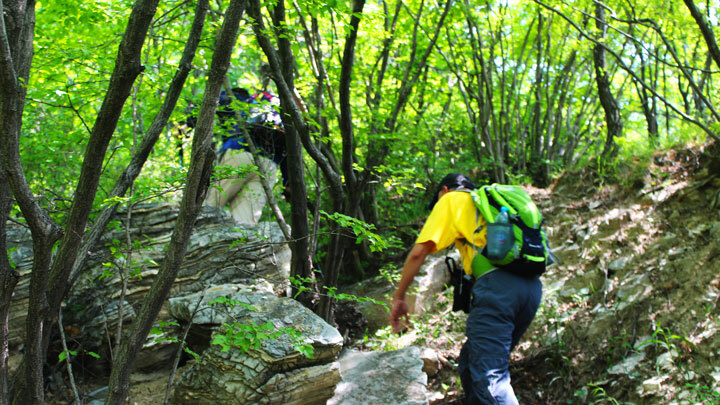 See a set of photos from our first group hike up Heituo Mountain.